Welcome back. Today’s blog topic was chosen by popular request, which is to say my wife Vicki suggested it. Do you remember last January’s post, Roosters’ Crowing? There was a parenthetical comment about a goat with a penchant for hanging out in a cattle trough. Watching that goat’s antics got Vicki started, and then she heard about some unusual goats at the Saturday morning coffee klatch. There are books and articles on everything you might care to know about goats and way too many videos of prancing young goats and goats climbing, being inquisitive and getting into trouble. Other than a bit of background, I’ll focus on two research studies and those unusual goats. Have you ever visited a petting zoo or farm that had goats? 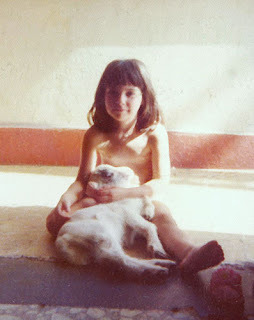 Those were domestic goats. That sounds obvious, but there’s more to it. Taxonomically speaking, “domestic goats” (Capra aegagrus hircus) are one of several subspecies of “wild goat” (Capra aegagrus). To confuse the matter, wild goats differ from “mountain goats,” which have their own genus and species (Oreamnos americanus) and only reside in the American Northwest. 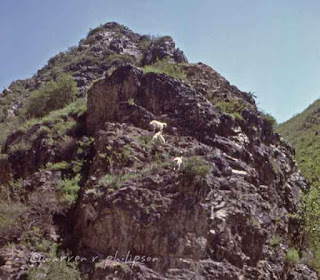 Apparently, goats I saw in China’s Tien Shan Mountains were wild goats. The difference between wild and domestic goats is just what you’d expect, though you might be surprised that there are over 200 breeds of domestic goats. They vary markedly in size (Nigerian dwarf goats are shorter than 2 feet at the shoulder; Boer goats can weigh over 300 pounds) and in suitability for intended purpose, be it dairy, meat, fiber, land clearing or as pets. There’s a wealth of anecdotal reporting on goat smarts--for example, their ability to follow finger pointing, recognize people, respond to their names and open clip hooks and doorknobs. Searching for blog topics three years ago, I filed away a small-sample study of goat intelligence. Researchers from Queen Mary University of London and the Swiss Institute of Agricultural Sciences worked with 12 goats to assess their ability to learn and remember a two-step task for retrieving food from a transparent plastic box--first pulling a rope to access a lever, then lifting the lever. Overall, 9 of 12 goats learned the task either directly or with other goat demonstrators, and they learned quickly, on average, within 12 trials. The number of trials did not differ between goats with a demonstrator and those without, suggesting goats prefer to learn on their own rather than by watching others. After intervals of up to 10 months, the successfully trained goats solved the task again within two minutes, indicating excellent long-term memory. Goats’ ability to follow a person’s gaze has been noted anecdotally, but it was tested within the past year by researchers from Queen Mary University of London. Thirty-four goats were each given three 1-minute trials to retrieve food from a transparent plastic box on the floor; only two failed. The successful 32 goats were then split into two groups and individually tested with an unsolvable task--2 minutes to retrieve food from a transparent plastic box that could not be opened. In both the initial trials and group test, one person was positioned near the food box and another was about eight feet away. During the group test, however, the person nearby faced the box for goats in one group, and he faced away for goats in the other group. The second person, positioned at a distance, looked at the box as a control for each test. Videotape analysis showed the goats gazed earlier, longer and more frequently toward the person as well as between the box and the person, when the person faced forward than when he faced away. The results provided strong evidence that goats exhibit audience-dependent, human-directed visual orienting and communicative behavior similar to that of dogs. At least on that score, goats would make good pets. The Saturday morning coffee topic was fainting goats, also called Tennessee fainting, wooden leg, stiff, nervous, scare and myotonic goat. The last seems most fitting since these goats suffer from the genetic disorder myotonia congenita. When goats with this condition are startled, their muscle cells can’t relax quickly after contraction. 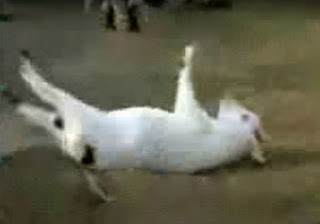 That few seconds of stiffness can cause the goats to fall over if they’re off-balance. They don’t actually faint or lose consciousness, and judging from their reaction and related conditions in people and some animals, it’s painless. Myotonic goats are quiet, good-natured, don’t climb or jump, and have relatively heavy muscle mass and a high reproductive rate, making them a good choice for meat production or a pet. Although their number declined in the late 20th century, they’ve been recovering with the help of various groups, such as the International Fainting Goat Association.